Elbrus-S is a system-on-chip, designed for the acquisition of computing resources in weapons systems, data-processing and control systems for industrial applications. Improved performance characteristics of the chip itself allowes for better memory capacity, faster input-output and an increase of the number of allowed processors in a multiprocessor system as of 4 or more. Elbrus-S includes one Elbrus 2000 processor core with 2 MB of cache memory, 2 memory controllers for access to local RAM, 3 controllers for interprocessor communications, access to other memory sections and controller for the I/O subsystem. 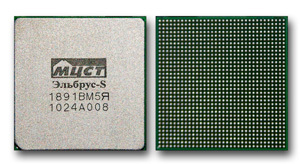 The Elbrus 2000 core is a high performance general purpose microprocessor with a very long instruction word (VLIW) architecture, designed for the 90 nm technology, running at a clock speed of 500 MHz. Interprocessor communications and memory access is organized by a distributed switch, with has support for data and cache coherency in a distributed shared memory system. Elbrus-S provides support for running Intel x86 software, as defined by the Elbrus 2000 architecture. Elbrus-S provides support for secure computing, as defined by the Elbrus 2000 architecture.